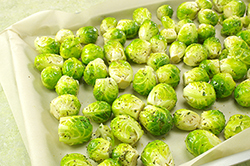 A big platter of these Brussels sprouts makes a delicious centerpiece for a fall dinner party. If you have a pork roast or a roasted chicken to serve with them, all the better, but the vegetables themselves may just steal the spotlight. Heat the oven to 400°F/200°C/gas 6. 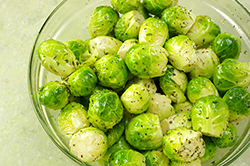 In a large bowl, toss the sprouts with the olive oil, and rosemary and season with salt and pepper. Spread them in a single layer on a large rimmed baking sheet. Roast until just tender, 15 to 18 minutes. 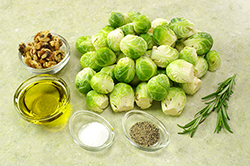 The single leaves that fall away should be dark and crisp, and the sprouts should be tender when pierced with a knife but not mushy. Take a bite, to be sure. 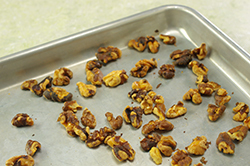 During the last 5 minutes or so of roasting, spread the walnuts on a small baking sheet or pie pan and slide them into the oven. Cook until lightly toasted, about 5 minutes. Pour onto a plate and reserve. 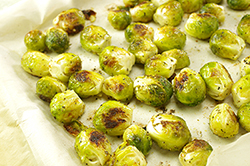 Mound the sprouts on a platter and drizzle the butter sauce over the top. Start with a small amount; you can always pass more at the table. Sprinkle the walnuts over the top and serve right away. A little of this sauce goes a long way, which is why the recipe yields only 1/4 cup/60 milliliters. It doubles easily, however, if you want to make more of it. The key is to balance the sweet, tangy, salt, and spicy heat. You don’t want the sauce to tip too far to the buttery, sweet-apple side or it will seem like a dessert sauce. But if you want a dessert sauce, you can have that, too, by leaving out the shallot and chile powder and adding only a pinch of salt. 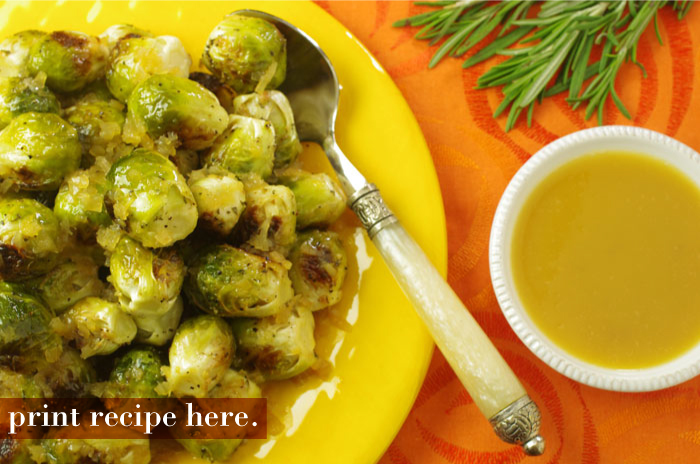 As a savory sauce, drizzle it over a fried ham steak, grilled sausages served with braised cabbage and onion, or roasted Brussels sprouts. For a rustic dessert, drizzle it over fromage frais spread on those lovely British cookies called wheatmeal digestive biscuits; McVitie’s brand is especially good. In a small saucepan, combine the cider, shallot, and pepper and bring to a simmer over medium-high heat. Cook, stirring and scraping the sides of the pan occasionally with a heat-resistant rubber spatula, until the liquid is reduced to about 2 tbsp, 15 to 20 minutes. Add the butter and start stirring it around in circles with a whisk, a fork, a wooden spoon, or anything that lets you “stab” the hunk of butter so that you can move it around easily. 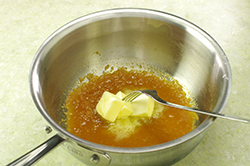 The butter will start to melt and the mixture will bubble and boil around the edges. 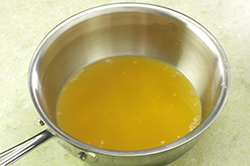 The melted butter should look creamy, rather than melted and oily. 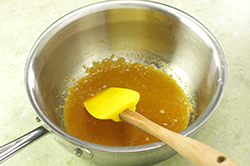 Keep stirring and blending until almost all of the butter is incorporated, then remove the pan from the heat as you work in the last bit. Whisk in 1/4 tsp salt, then taste and adjust the seasoning with more salt, pepper, or a touch more butter. For a perfectly smooth sauce, strain it through a fine-mesh sieve. 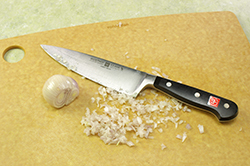 If you are okay with the shallot, serve as is. If possible, serve right away. STORAGE: To keep the sauce warm, hold it in the saucepan for a few minutes. For longer keeping, transfer it to a bowl set over a saucepan of hot water (the water should be no hotter than 110°F/43°C). You can also keep the sauce in a thermos for up to 2 hours. 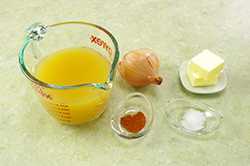 The sauce cannot be stored in the refrigerator, as it will separate when reheated. QUICK CHANGE: Use pear cider or a mix of apple cider and unsweetened cranberry juice (not cranberry “cocktail”) instead of the apple cider. Add 1 fresh rosemary sprig, 1 tsp balsamic vinegar, or 1 clove garlic, chopped, to the first addition of cider. INGREDIENT NOTE: The Espelette pepper is cultivated in the commune of Espelette in the Basque region of southwestern France. It is a mild chile and is typically dried and ground.